This sheet was designed when I realised that the students in year 8 needed to actually learn their detached pronouns because they had not been taught all of them previously. I made flashcards on detached pronouns as well so I could teach them and review them too (the fridge copy will be sent a week early, so I’m hoping some parents have helped their children learn them already!). This review sheet will be used to test their knowledge insha Allah! Hope this helps with your students. Please leave a comment or suggestion to help improve this site. 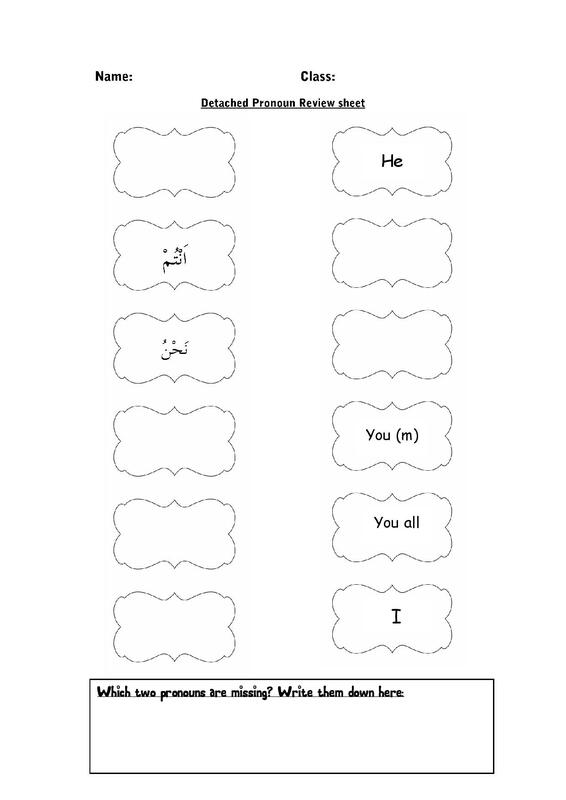 This entry was posted in Arabic worksheets and tagged activity, arabic, arabic grammar, arabic worksheet, attached, fun, game, grammar, grammar points, Juz Amma, Juz Amma resources, Quran curriculum, quran syllabus, review, review sheet. Bookmark the permalink.